Butler (Porous Pockets) – From SpongePedia, the biggest SpongeBob-wiki in the world! Butler just appears in the episode Porous Pockets. He works for SpongeBob. When SpongeBob was rich, SpongeBob made him stand at the front door to check what people were allowed to come into SpongeBob's House and which people weren't allowed in. Not much is known about him. The Butler is a green fish with black hair. He wears a blue suit, a white shirt, blue trousers, a red and golden belt, black shoes, a red bow, and gold underwear. 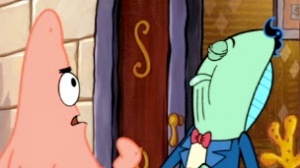 Patrick: Uh…I’m here to see SpongeBob. Butler: And are you on the guest list, sir? Butler: Well, then, I’m afraid I can’t let you in, sir. Good day, sir. Patrick: Good day. Uh, your shoe’s untied. This page was last modified on 23 June 2011, at 09:37.